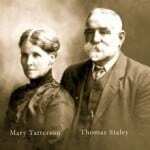 The latest update of the Staley Family History includes recently discovered information on the descendants of Margaret Staley and Thomas Law McMillan, this was sparked by the finding of a monumental inscription at the Melbourne General Cemetery. Thomas had a big career change from teenage lead miner in 1841 to medical student in 1851, by 1854 it seems he’d graduated as a Doctor, arrived in Victoria and married, eventually becoming President of the Medical Society of Victoria in 1878, there was possibly a trip back to Edinburgh in the 1860’s for the family as daughter Edith Agnes’s marriage certificate gives her birth place as Edinburgh, Scotland. This entry was posted in History and tagged McMillan, Staley on February 8, 2012 by Peter.